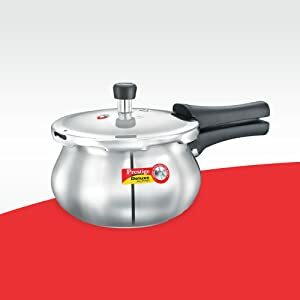 Blending contemporary styling with the beauty and dazzle of stainless steel, the Prestige Deluxe Alpha Stainless Steel Pressure Cooker made up of high quality stainless steel, adds to the aesthetics of your kitchen with loads of features that include euro clad base with Induction bottom for even distribution of heat, and the unique Pressure Indicator for extra safety. 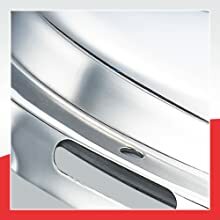 Prestige Deluxe Alpha base is steel aluminium steel sandwich base covers entire pressure cooker bottom. Alpha base is energy saving and allows fast cooking. This heavy duty unique alpha induction base provides even heat distribution without hot spots. Suitable for Induction and gas cooking, this versatile cooker provides you maximum utility. 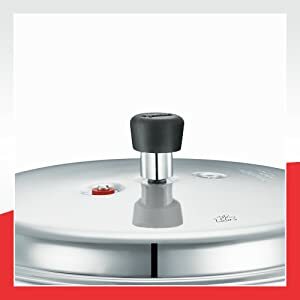 It is an outer lid pressure cooker made from high Quality Stainless Steel cover and body which is heavier in weight, heats fast and long lasting. The Handi shape of the body makes it ideal for cooking variety of Indian cuisines. It is the first level of safety feature to release pressure above 1 kg/cm2, which makes the cooking safe and time saving for you. It is made up of stainless steel for durability. 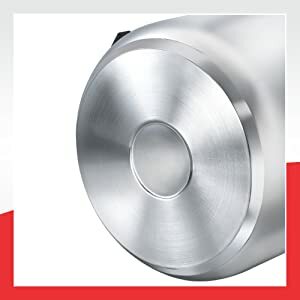 This is the 2nd level of safety provide in Prestige pressure cooker, in case there is any blockage of vent tube, the CGRS will release the steam from cook-top. Thus making it safe for usage. 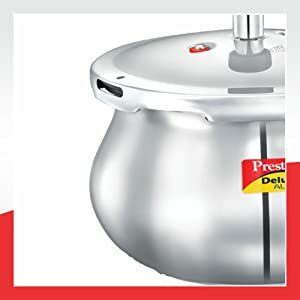 The Prestige Deluxe Alpha Stainless Steel Baby Handi is a stylish, sturdy and compact pressure cooker for your daily use. Manufactured with double screw handles, this handi is extremely sturdy and durable. Ideal for cooking Indian dishes, this cooker has a pressure indicator and a controlled GRS that ensures your safety in the kitchen. From shallow frying, roasting, steaming, boiling and much more, this is this multifunctional handi that you need in your kitchen. This ultra-trendy and modern cooker requires minimal maintenance as it is dishwasher safe. From preparing biryani to steaming vegetables, this cooker is equipped to do it all. Manufactured by Prestige, you can be assured of unmatched toughness and durability. As it comes with an alpha base induction bottom, you can safely use this pressure cooker on both induction cooktops and regular gas stoves. Give an authentic touch to everything you cook with this Prestige handi. As it is made from high quality stainless steel and loaded with features, this product is a modern cooker that you need for traditional cooking. The body is fitted with 2 screws instead of single screw, making it last longer and durable. Prestige – A kitchen appliance brand. It is caters to the various needs of home makers in the country. It has varied product portfolio ranging from pressure cookers, non-stick cookware, gas stoves, Induction Cook-tops, Mixer Grinders to varied other electrical appliances and kitchen tools. The company has been at the forefront of innovation and has been the fastest growing company in the kitchen appliance space.